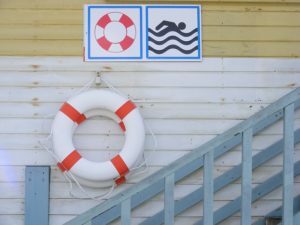 Lifeguards who fail to act when swimmers are in danger negligently place people at risk and can be held liable for their failure to provide assistance. Just because a lifeguard is present doesn’t mean people are swimming in safe waters. Serious accidents when lifeguards are on duty are an all too common event. It is estimated that more than 10 people each day die from drowning. Of these, more than 20% of fatalities involve the death of a child under the age of 15. Nationwide, it is estimated that each year more than 100 drownings occur when a lifeguard is present. Of all childhood drowning fatalities, over 60% occur within swimming pools and not in open water. This makes swimming in a pool more dangerous than boating or a summertime swim at the beach. Lifeguards give swimmers a false sense of security. The presence of a lifeguard does not mean a pool is safe. The lifeguard can become distracted or there may be too many people in the pool for the lifeguard to see a drowning swimmer. Moreover, the lifeguard can be impaired, engaging in other work-related duties, engaging in conversations or sending text messages, or simply be away from the pool when a swimmer needs assistance. Lifeguards can also be overworked which can lead to fatigue. The problem is especially pronounced during warmer weather months and high-traffic periods when more people use the pool. Fatigue is one of the most common causes of lifeguards failing to act when swimmers are in danger. If lifeguards are not properly rotated or given sufficient breaks at regular intervals, they can lose focus and miss swimmers who are in danger. While lifeguards can be held liable for their failure to act, so too can an employer who fails to adequately train, properly monitor, and efficiently schedule lifeguards within the swimming facility. Drownings are preventable when trained lifeguards perform their duties. When swimmers are in trouble, lifeguards have a duty to act that includes rescuing the swimmer from danger and performing CPR and other first aid services until medical personnel arrives on the scene. When lifeguards are properly trained to do their duty, drowning rates drop dramatically.